I love chocolate dipped oreos and thought I would try making some as little gifts this year. You can buy the white chocolate fudge covered Oreos, but sometimes they are hard to find and I think dipping them yourself makes it easier to insert the stick in to the Oreo. To make, I used cake pop sticks and stuck them (very carefully) in some double stuffed Oreos. (I used the holiday oreos so that they are red inside, just a little bit prettier). Melt some white chocolate chips with a little bit of shortening to make the chocolate thinner. Very carefully, dip the oreos in the melted chocolate. You will need a spoon to help coat the oreos. Make sure to cover a little part of the stick because when the chocolate hardens it will help to keep the oreo on the stick. Place on wax paper. 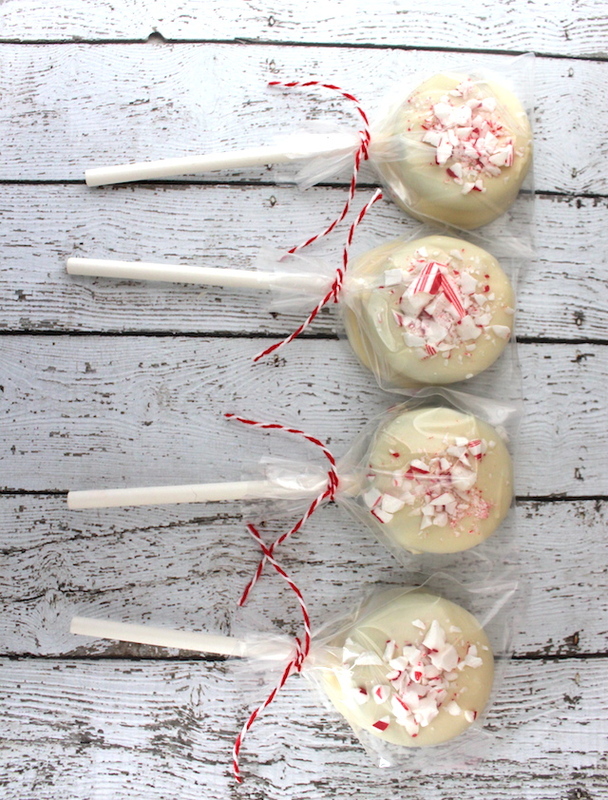 While the chocolate is still soft, sprinkle on some crushed candy canes. Then let them cool in the refrigerator.